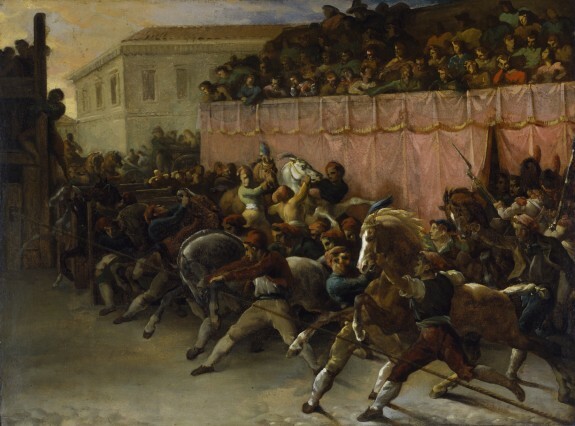 Description From the mid-15th century until 1882, spring carnival in Rome closed with a horse race. Fifteen to 20 riderless horses, originally imported from the Barbary Coast of North Africa, ran the length of the Via del Corso, a long, straight city street, in about 2½ minutes. Throughout his career, Géricault lovingly depicted the horse as a metaphor for unfettered emotion and power. The artist initially planned to paint a canvas of this subject more than 30 feet in width; he completed 20 small oil studies before abandoning the project. In other variations on this theme, Géricault set the race in ancient, rather than contemporary, Rome. Géricault. Musée du Louvre, Paris. 1991-1992. Rome!. Museums of Liege, Liege. 2018. Provenance Géricault Estate Sale, Paris, November 2-3, 1824, no. 81; Sale, A. M. Couvreur, Paris; Sale, E. Secrétan, Paris, July 1, 1889, no. 35; H. O. Havemeyer, 1889 [mode of acquisition unknown]; H. S. Henry, New York, 1899, by purchase [Durand- Ruel, as agent]; H. S. Henry Sale, New York, January 25, 1907, no. 21; Henry Walters, Baltimore, 1907, by purchase; Walters Art Museum, 1931, by bequest.